The first thing i noticed when i opened the package, before i even had a peak inside, was the over-whelming smell of honey, it was amazing. It wafted out of the packed and filled my whole room, if you are looking for a fragrent soap and you like honey, then i highly recommend this one to you. 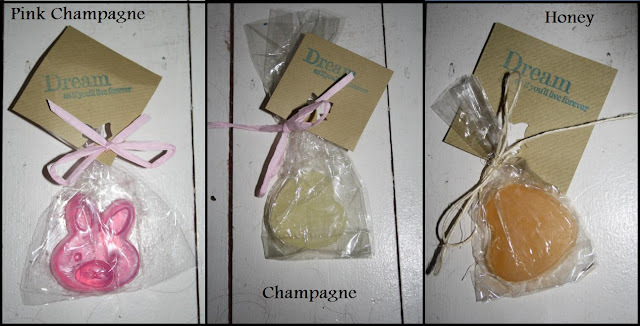 After a few minutes of taking in the smell, i delved into the envolope and pulled out three super cute little soaps, one was moulded into a bunny and the other two were love hearts. The smell was coming from the heart shaped honey so i put that aside and investigated the two other less in your face smells, champagne and pink cnampagne. I couldn't really get any smell from them though the packaging, which is amazing by the way, very cute and chic but when i opened them, there was a lovley smell, not to over powering for those of you with a sensative nose. The soaps were sent out quickly, and Essex soap box are great, especially with replying, get in touch! Please contact me at xxgeorgina18@hotmail.co.uk if you would be interested in having me blog for you, like i have for Essex Soap Box!